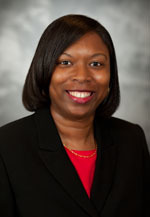 Dr. Tracey Carter, assistant professor in the College of Law, recently served as a mentor during Preston Taylor Ministries’s “Spring Break in the Marketplace.” The program provides job shadowing experiences for the youth of Preston Taylor Ministries over their spring break each year. Volunteer mentors spend a few hours showing a student their workplace, discussing their day-to-day schedule, introducing students to new careers and encouraging students to meet their goals. Carter discussed her legal career and position at Belmont with her mentee, encouraged her to continue to excel academically and introduced her to various faculty, staff and administrators within the College of Law during her recent campus visit.